Including Buddhist mythology: stories about Buddha and his previous lives (jatakas) and Buddhist art. Siddharta Gautama, the man who called himself the awakened one (Buddha) after a spiritual experience, had a profound effect on world history. He lived around 300 BC in what's now Nepal and Northern India. He started out the son of a local chief (or king as legend would have it), and ended up with followers all over the Ganges delta. His teachings are a logical result of the Upanishadic period: a period in which speculation about the soul, reincarnation and so on had combined with yogic practices into various spiritual movements. Each of those movements lead by a charismatic man (no women made that prominent a mark on history at the time, though there were a few strong nuns under Gautama's followers). Contemporaries of Buddha include the ascetic founder of the Jains, Mahavira, who walked around naked and ultimately starved himself to death. The Jains would be as influentials as the Buddhists within India itself, and even managed to have a permanent place in it's history. Buddhism however was not bound by the restrictions of the Hindu caste system and therefore more suitable for the world outside the peninsula. It spread to all of Southern Asia, including what's now Indonesia, into China and through China into Japan. In the last century it has also made quite a mark on the Western world, though it's too soon to tell whether it has really taken root here. In the meantime it died out in India in the 15th century. Islam gave it it's death blow, but a reformed Hinduism had long been chipping away at its roots. Buddhism had become a cumbersome thing: monasteries and celibate monks and nuns are a costly investment for any community. In the 20th century Buddhism made a come back in India through two routes: untouchables wanting out of the Hindu caste system converted to Buddhism in great numbers under the leadership of Ambedkar. After the invasion of Tibet by China, the Dalai Lama and many of the Tibetan people moved into India, probably making a permanent home there. The impact of Buddhism on Asia is perhaps clearest from the world of architecture. Specifically, the famous Mahayana Buddhist temples of Borobudur on the Indonesian island Java. It dates from the 9th century A.D. and it's huge. It contains six square platforms with three circular ones on top. There are 2,672 relief panels and 504 Buddha statues. That is: to the extent that they haven't been pillaged or destroyed. The world knows Afghanistan now mostly for it's fundamentalist Islam. It's mountainous terrain and various independent tribes make it an ideal hiding ground for terrorists. However, the region was once, in the time before airplanes and steam boats, essential for trade. The famous silk route went right through there. And through the silk route Buddhism spread. It did not make much headway further west, at that time anyhow. But it did leave a lasting impression on the Afghan people themselves. Buddhism was often a religion for trades people: the ethics combined well with what made them successful. Also, tradespeople the purity taboos of Hinduism did not combine well with the large variety of people they met on the road. 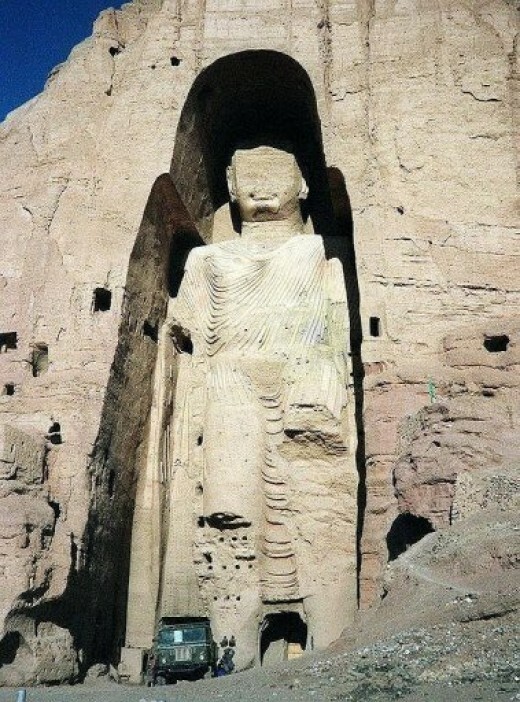 Above you can see the now destroyed, but still huge, Buddha statue of Afghanistan. It was the highest Buddha statue in the world. The picture is from BEFORE the destruction in 2001. As you can see, there was already a lot chipped off, perhaps by previous religious fanatics. I don't know if Japanese Buddhism even requires an introduction. Zen is after all a household word these days. Zen is a form of Buddhism in which direct experience of Enlightenment or Awakening is thought to be the most efficient path towards Nirvana. It cuts away at the clutter of ages that has developed around Buddhism in the form of ritual and philosophy. However, it's not as free of either as some westerners believe. 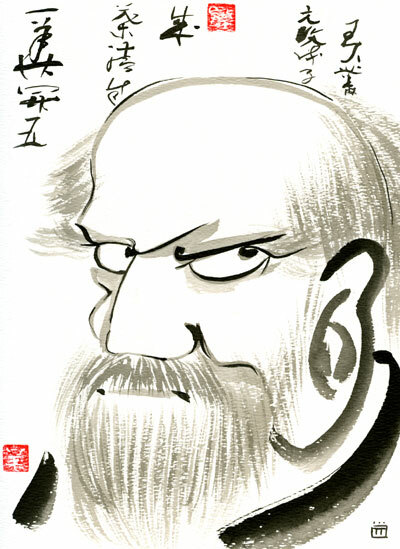 Be that as it may, the Zen philosophy of simplicity has produced great pieces of art. The piece on the right is only one example. So, what's the influence of Buddha on world history? The influence of Buddha on world history can hardly be over estimated. His teachings and organization influenced religion and philosophy in China, it reached as far as Japan. It impacted art, culture and architecture in Indonesia, Vietnam, Laos, Sri Lanka - the whole of Southern Asia in short.